Sweet Potato - common name applied to a perennial, trailing herb of the bindweed family. The plant, which is native to tropical America, is cultivated on sandy or loamy soils throughout many warm regions of the world, and exists as an important food staple in a number of countries. It is planted primarily for its thick, edible roots, called sweet potatoes. The name is due to a sugar content. Two main types are commonly cultivated: a dry, mealy type, and a soft, light-to-deep-yellow, moist-fleshed type. The species often called wild sweet-potato vine, manroot, or man-of-the-earth is not edible, but is cultivated as an ornamental vine. Carbohydrates generally make up between 80 to 90 % of the dry weight of sweet potato roots. The sweet potato yields an important starch, which is used as a food starch in noodles etc. and technically for sizing textiles and papers, for the manufacture of adhesives and in laundries. The process of extracting and refining the starch is similar to the potato starch process. The pink and yellow varieties are rich in carotene, the precursor of vitamin A. 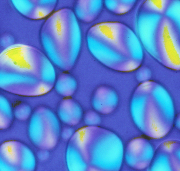 Sweet potato starch granules vary from 4 to 40 microns with 19 micron in average. The small granules affect extraction procedures in particular the dewatering. The amylose content is 19% - 25%. 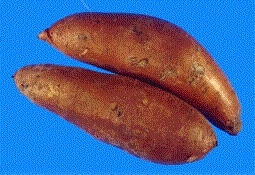 Scientific classification: The sweet potato belongs to the family Convolvulaceae. It is classified as Ipomoea batatas. The species called wild sweet-potato vine, manroot, or man-of-the-earth is classified as Ipomoea pandurata. Viscosity profile of 9% sweet potato starch slurry on Rapid Visco-Analyzer (RVA) model 3D. China is the world's largest sweet potato producer, accounting for 80-85 percent of global production. The majority of China's sweet potato is grown in seasonal rotations with other staple crops and is used for animal feed or to produce noodles and industrial starch. Sweet potatoes grow year-round in the tropics. Sweet potato has the shortest growing cycle of the root crops grown in the tropics. The crop is normally harvested about 4 months after planting and harvesting may be spread over several months. In a temperate climate harvest must take place before risk of frost.